Honda is often known for innovation, but this N-One model plays another card. One we had never seen in a Honda before: nostalgia. 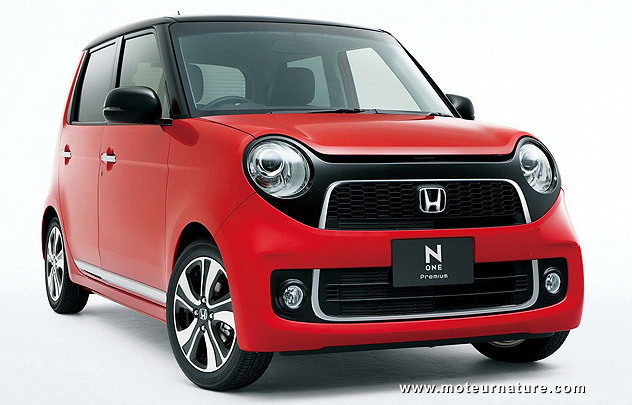 This is a 2013 model which looks comes from the 1967 N360, and this is a first for a Japanese brand. Fiat with the 500, Ford with the Mustang, Volkswagen with the Beetle, Europeans and Americans do it, but few people ever thought the Japanese had models as iconic as those in people’s minds. But Honda thought otherwise, and it has just launched this N-One on its home market. It’s not a real car though, it’s too small for that. 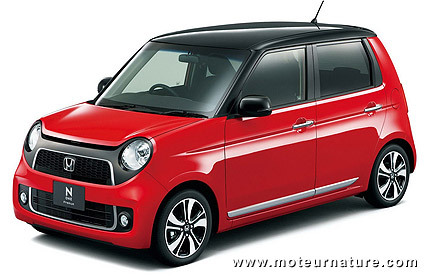 The Japanese will see it as a kei-car, and regulations will give it extra parking rights in crowded Japanese cities. Americans see the Chevrolet Spark as a very small car, but this Honda N-One is a full 5 inches narrower. So it’s really small, and it would be very difficult for 4 guys with large frames to fit in it. The car’s height will help but a 58′ width with a 64′ height make for very unusual proportions and the N-One might be one of the very few cars which look better in pictures than they do in the flesh. If only the N-One had great fuel economy, but that is not the case. The Fit hybrid, a much larger car, and way better overall, is more fuel efficient. This may be the result of too much downsizing in the N-One. Downsized engines are usually very effective in reducing fuel consumption, but regulation limits kei-cars to 660 cc engines. Sure, the base N-One is only 1850 lbs but there’s only 48 lbs-ft of torque available. It will happen that the driver has no other choice but to floor the accelerator to keep up with traffic. A turbocharged version is better with 64 hp and 77 lbs-ft, but with a CVT gearbox and 4WD, its weight is up to 2000 pounds. Those looking for spirited driving better look elsewhere, just like drivers in search of great fuel economy.